Brunswick House is a large Georgian mansion in Vauxhall, in the London borough of Lambeth. In the eighteenth-century Brunswick House (originally Belmont House) was a grand house that stood in five and half acres of parkland and was originally built with a coach house, offices, stables and three acres of gardens that reached down to its own a timber dock on the Thames, on lease from the Dean of Canterbury and frontage onto the Old Portsmouth Road. The vaulted cellar still gives an idea of its size. Located in Vauxhall, in the Nine Elms quarter of London. The house is an emblem of bygone elegance among major glass, steel and concrete office blocks and riverside apartments. The house is just a short walk from Westminster, sitting on the south bank of the Thames. Its near neighbours include the MI6 offices and the newly built US Embassy. 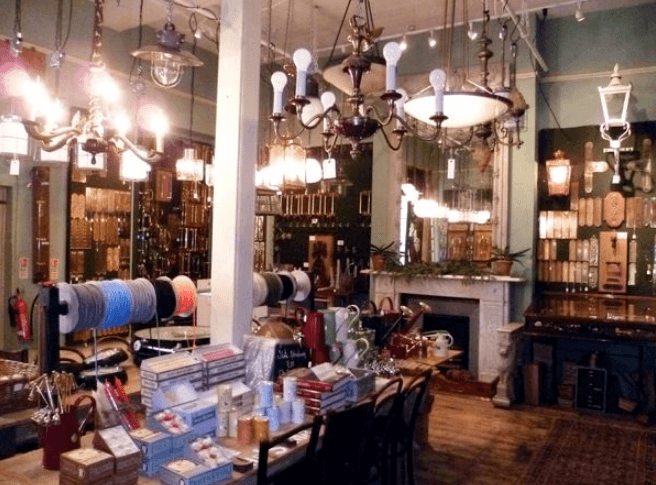 Brunswick House contains a mixture of fine furniture, antiques, statues and stonework and decorative ornaments reclaimed by the London East End company LASSCO, which has dealt in reclamation and salvage since 1979, taking on Brunswick House in 2005. What began as an architectural salvage yard within a rundown Georgian mansion, has since evolved into a well-respected restaurant, bar, coffee shop, meeting place and party venue.As the middle men between the demolition trade and architectural design, LASSCO connects customers with rescued relics for interiors. These shops and yards are what provide the back drop for unique venue hire and dining experiences. 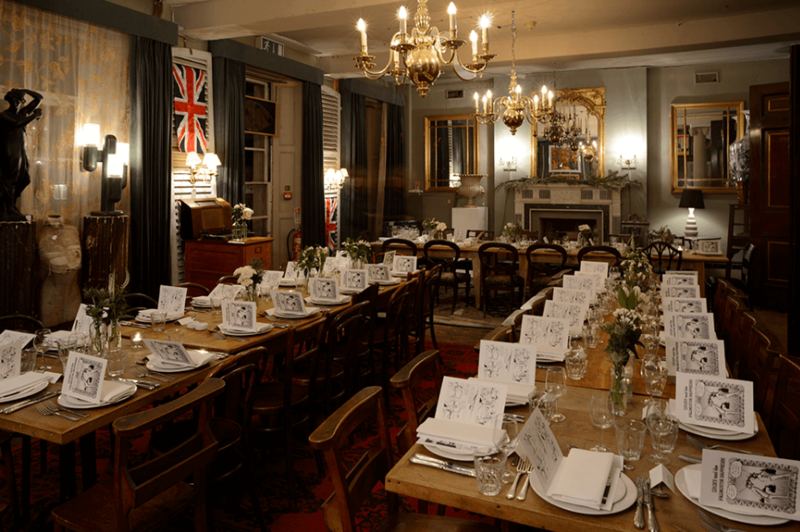 You can book a room at Brunswick House for any event, with fabulous catering services from the Brunswick House restaurant. There are seven rooms spread over three floors available for private bookings from intimate gatherings to wild extravagances where the interiors, courtyards and roof terraces provide a unique backdrop to your event, being full of fabulous architectural salvage, that changes daily.The Brunswick House Statuary Garden is a striking and unexpected arbour of greenery and sunshine ideal for private summer cocktails and canapés receptions that is freely available for inclusion in the rental of the House for private events. 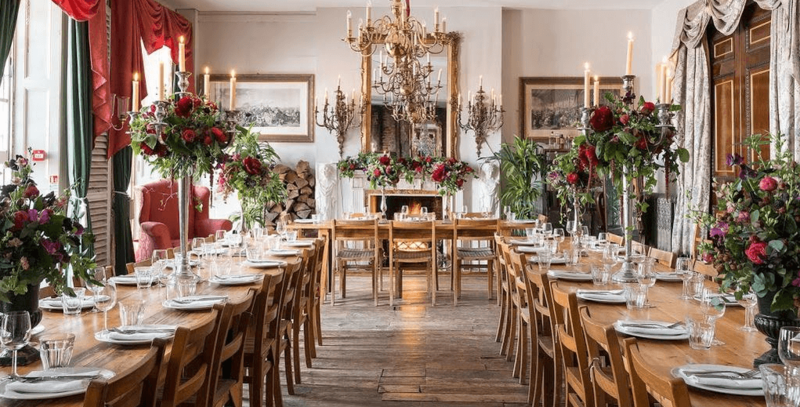 Brunswick House has a long experience in hosting events large and small, with expert events specialists to help you deliver grand events, meetings and intimate gatherings. With a beautiful and versatile old building, critically-praised cuisine and warm hospitality from the team, Brunswick House is committed to delivering a stylish and memorable experience for you and your guests. An impressively shabby elegance is how best to describe this room of five bays with full height windows with access to an outdoor roof terrace with two good open fires and grand fire places. The green velvet curtains enhance the elegant tone of the room. It was once the drawing room of the Duke of Brunswick and later became the snooker room of the LSWR Scientific & Literary Institute (Railwayman’s Club). The Saloon is interconnected with the Smoking Room, and the two rooms can be hired together. A south facing elegant first-floor room with an open fire, glass chandeliers and original, old floorboards connected by magnificent mahogany doors to the adjacent Saloon. It got its name from being the Smoking Room of the Railwayman’s Club – Board Meetings. A light, high-ceiling room with tall windows a grand fireplace and equally refined furnishings. The Parlour adjoins the Library if you need to increase capacity. A room full of tall bookcases filled with books. There is a post in the centre of the room created from railway lines which were put in at the time of the Railwayman’s Club to support the weight of the billiard tables on the floor above. The Library is particularly well suited to receptions and cocktail parties. A lofty mid eighteenth century panelled room adorned by a superb chandelier and a splendid fireplace. 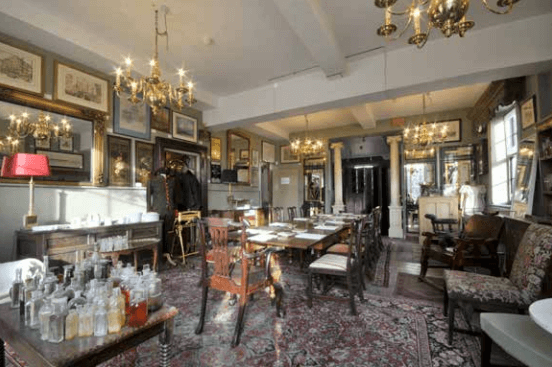 An intimate dining or meeting room furnished impeccably with period objects in authentic style. 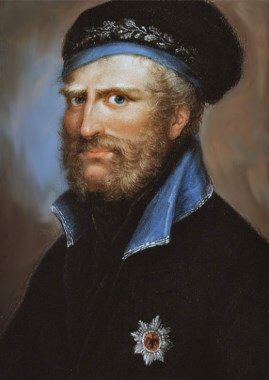 Below the Georgian mansion are a series of cellars, wine vaults, sculleries and pantries with large fireplaces, ancient flagstones and open brickwork, which also incorporate the remains of an earlier seventeenth century building that Brunswick House was built around. This is an intimate and atmospheric event space and being so unexpected is a perfect venue for any memorable event. 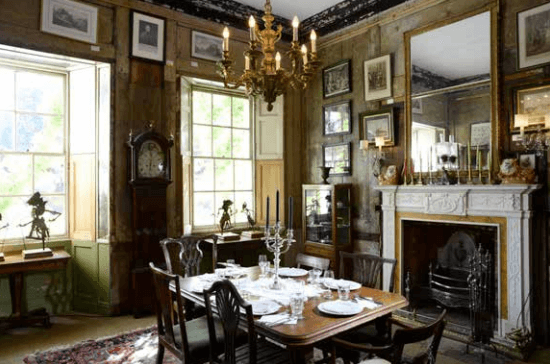 Brunswick House is a great location in central London. The juxtaposition of this Georgian building amongst the glass, steel and concrete of more recently built properties that surround it, make it a remarkable and unforgettable venue for any event.The LASSCO owned venue is available for hire in part or as a total exclusive package for an event. There is also an exceptional restaurant to cater for your requirements. Located on the corner of Wandsworth Road and Nine Elms Lane, opposite the Vauxhall Bus Depot it is easy to access Brunswick House on foot as the Thames path runs past the front door. The House is just a two-minute walk from Vauxhall Tube Station in Zone 1 and you can also arrive by riverboat, alighting at the Tate Britain riverboat pier. 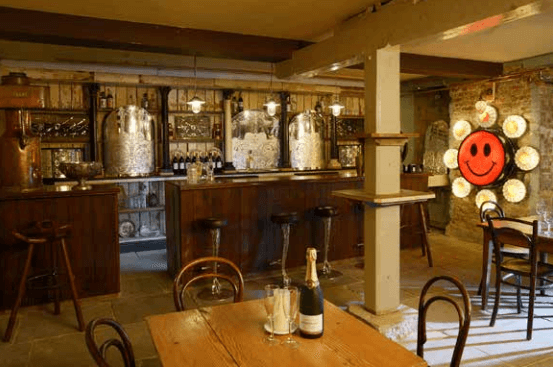 Vintage venues can offer a number of options for your event, whether it be a board meeting, a marriage ceremony and wedding reception or other celebration.